Funeral Services will be held 10:30 A.M., Wednesday, April 3rd at chapel of Higby-McQuiston Mortuary in Aurora. Rev. Adam Snoberger will officiate. Interment will be in the Aurora Cemetery. Visitation will be from 5 - 7 P.M. Tuesday at Higby-McQuiston Mortuary in Aurora. Memorials may be made to the family to designate at a later date. Condolences may be e-mailed to the family through the mortuary website at www.higbymortuary.com. 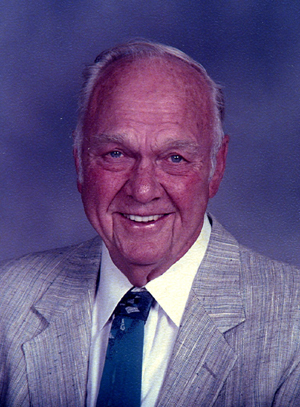 Maylon John Hanson, the son of Paul and Julia (Shaneyfelt) Hanson, was born in Aurora, Nebraska on November 25, 1930 and died in Grand Island, Nebraska on March 29, 2019, at the age of 88. He grew up on the family farm north of Aurora. Maylon graduated from Aurora High School and then began farming with his family. In 1950, Maylon married Katherine Shull and they had three children: Bruce, Katheryn and John. Maylon served in the U.S. Army Signal Corp for two years being honorably discharged in 1954. He returned to farming and being a part-time rural mail carrier. In 1970, Maylon went into the aviation business, starting, Aviation Services and Avionic Systems in Grand Island. In 1989, Maylon married Karen Keiper. They resided in Grand Island, where they attended Trinity Lutheran Church. After retiring in 2002, Maylon remained active, helping others and having time for their trips to the casino. Maylon was very involved in his community. He was a member of the Fire District, Fair Board, Flying Farmers, Saddle Club, Jaycees, where he served as the State Vice President for Nebraska and was a 63 year member of the Aurora American Legion Post #42. Maylon carried his Christian faith throughout his life, he especially loved his family, yet also took time to care for those around him. He enjoyed making Christmas cookies and candies with family and tinkering with anything mechanical. He was preceded in death by his parents, brother and sister-in-law, Donald & Pat Hanson and first wife Katherine. Those left to cherish his memory are his wife, Karen of Grand Island; children, Bruce (Lisa) Hanson of Aurora, Katheryn (Mike) Peters of Bullhead City, Arizona, John (Sandy) Hanson of Papillion, Tony (Vickie Rodabaugh) Keiper of Grand Island and Monte (Jody) Keiper of Crystal Lake, Illinois; 17 grandchildren; 17 great-grandchildren and 4 great-great children and many other relatives and special friends.